In the Medieval debate about whether Jesus was an ascetic or a materialist, there is a third possibility: perhaps his view of life was one of immaterialism. St. Michael’s Abbey, the inspiration for the setting of The Name of the Rose. The 1986 movie, The Name of the Rose, was a great success, winning several awards and bringing in a box office of $77M against a budget of only $17.5M. It was based on the hit novel of the same name, written by Umberto Ecco. Ecco is a philologist and medievalist, and the success of a novel focusing on obscure medieval practices and problems was a great surprise to everyone. I have mentioned William of Ockham, and Occam’s Razor.1)Ockham was his family name, Occam is the Latinized form. At the time he lived, Ockham’s real fame – or notoriety – came from an argument within the Church that Jesus was basically the founder of a large corporation, the first multi-national conglomerate, if you will. Ockham savagely lampooned this idea in his writings. He subsequently had to be smuggled out of England for fear of his life. The exciting plot of The Name of the Rose focuses on a murder mystery which takes place in the labyrinthine library of a monastery, investigated by William of Baskerville (a nod to both Sherlock Holmes and Ockham) and his assistant, Adso (again, Holmes: “My dear Watson”). What is largely forgotten is that the two were at the Abbey to prepare for an upcoming meeting and debate about Apostolic Poverty, which raised the question of whether Jesus owned anything, anything at all. This debate was at least partly precipitated by Ockham’s writings, who was summoned to Avignon for charges of heresy in 1327 – the year the story of The Name of the Rose takes place. Before continuing I should point out that, although I am highly spiritual, I am hardly religious. Regardless, Jesus was a pivotal figure for morality and spirituality in the development of civilization. To the point here, and to the debate about whether Jesus was a materialist (corporate CEO) or ascetic (he owned nothing at all and denied himself pleasure), I would add a third possibility. I think Jesus was an immaterialist.2)Note that the philosopher Bishop Berkeley used the term ‘immaterialism’ in a different way than I am using it here. Apologies to the philosophy students. It simply didn’t matter to him either way. If something were available, Jesus owned it or consumed it, even enjoyed it. If something were missing, he instead focused on what was available. We see this in the records of Jesus’s life. When Mary washes Jesus’s feet – an act of extreme submission on her part, but luxury for him – he defended her. But he also told the parable of the lily of the fields, one of my favorites, which says don’t worry about the particulars. I also like to tease my Southern Baptist friends by pointing out that with his first miracle, Jesus not only created wine, he created good stuff. And of course, although he was none too happy about his crucifixion, the Gospels suggest he could have avoided it, but he chose not too. He accepted it. There are many interpretations of all of these, and no two people interpret them the same way. But to my mind, the pattern on materialism is, there is no pattern. When things are good, enjoy them and be happy. And when they are not good, focus on what is and try to be joyful anyway. Such an approach is Buddhist as well as Christian, and appears in all sorts of spiritual and philosophical approaches, such as stoicism (a Greco-Roman approach that heavily influenced early Christianity) or Epicureanism (another Greco-Roman philosophy that the Renaissance church adamantly rejected in favor of self denial). Immaterialism is, in fact, part of many spiritual and mystical approaches. It is interesting that all modern science starts in the West, i.e., west of the Dardanelles. But all of the great religions start in the East, on the other side of the Hellespont. 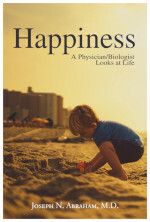 In science, we strive for happiness by changing reality to fit us. In spirituality, we instead change ourselves to fit reality. Immaterialism means changing the changer. So much of my writing here has been about opening our minds to new possibilities, and the problems created from closed mindedness and hypocrisy. It is easy, and harmful, to constantly find fault with others while ignoring the beams in our own eyes. External power is the overriding goal of science, and so the source of Western power comes from changing externals, in the assumption that this will make us happy. But happiness is an internal state, and internally generated. So the problem is, changing the world around us cannot bring true joy nor happiness. We can have it all and be miserable, or we can have nothing and choose joy. For true happiness, the material is largely immaterial. We rarely notice this, however. We see the rich and powerful and famous, and assume they are happy, we assume that we want to be like them. I will not argue the error of this, but instead refer you to the extensive research literature, which comprises such lofty publications as The National Enquirer, Star, The Globe, and all those other fine examples of supermarket journalism. Read about famous people. Do their personal lives seem any fuller than ours? Of particular interest, note how their money, power and fame interfere with happiness, producing broken homes, broken marriages, estrangements, political backbiting, and betrayals by friends (who often betray them by selling their private details to the tabloids… ) Actually, you don’t have to bother to read the stories, just look at the pictures. How much fun can it be to have paparazzi and groupies follow you 24/7, invading your privacy and trying to exploit the most intimate details of your life? But for 10,000 years of humanity, some people – by uncanny coincidence, the rich and powerful and famous – have told us, and convinced us, that happiness is not ours to create; rather, it is for them to dictate. To be happy, we must pursue what they pursue. Throughout civilization our leaders have loudly proclaimed that happiness comes from controlling the things, and the people, around us. And when someone like Ockham suggests otherwise, they try to kill him. This is not esoteric. We have reached a point in history that if we keep trying to control and change everything else – and everyone else – and if we do not instead change ourselves by opening our minds to new ideas, if we do not begin seeking joy through awareness, tolerance, and immaterialism, it creates large problems. Problems so large that we might just wipe ourselves off the planet. Picture of St. Michael’s Abbey, courtesy of Wikipedia.org. 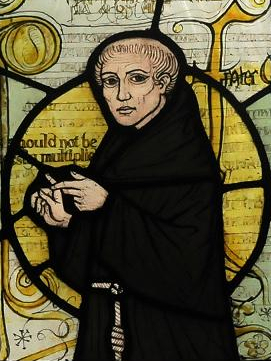 Picture of William of Ockham, courtesy of Wikimedia.org. 1. ↑ Ockham was his family name, Occam is the Latinized form. 2. ↑ Note that the philosopher Bishop Berkeley used the term ‘immaterialism’ in a different way than I am using it here. Apologies to the philosophy students. Something I learned this morning is marginally related to this discussion. I learned that in the Holy Land there is a veritable cottage industry investigating what kind of wine Jesus was likely to have drunk. By using recipes found in old vessels, plants that, although now growing wild, were available during his lifetime, and even seeds still found in excavated structures, researchers are trying to recreate the wines of his day and locale. Interesting, no? Very interesting. Reminds me of Flag Porter, although that is much more recent. I have to say, though, I can’t imagine the wine would have been very good in Jesus’s time; we have gone through two millennia of cultivation and refinement since then (at least the grapes have), with the development of many varietals that probably did not exist back then. But I’ll keep an open mind, and look forward to trying some. I agree with so many aspects of your point of view. Recently, I simply said , “Praise Jesus.” The person next to me interjected. How do Christians even know it really was a Jesus? Of course I walked a way feeling , each person has their own point of view. Yet, I felt sad for her. Enjoyed this article!! That touches on something I have will include in a future post. Someone was criticizing Christianity, pointing out that there are something like 1200 religions today, and the adherents of all of them think they’re right. My response was that the problem isn’t that they think they’re right, but rather it’s those who are sure all of the others are wrong.